Bart were invited by Avon & Tributaries Angling Association to join them last Sunday as part of their weekend of activities to promote angling and their lovely waters. A relaxed roving “match” was arranged to see how many species of fish could be caught whilst showing some prospective members the water. 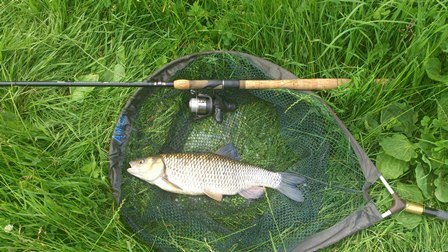 A number of children were fishing in the Orchard on the Sunday and one lucky lad caught a chub as we arrived. The roving match produced seven or eight species of fish despite conditions being bright. There were a lot of dace and small chub , roach, perch, gudgeon, a pair of pike , a bream and hosts of fat minnows. No barbel were caught although some were seen on the lower stretches and a carp made it’s presence known but did not oblige the anglers by taking a bait. BART enjoyed the day immensely and joined the organisers at the local pub to talk about the river and it’s challenges after the fishing. Dr Julian Greaves managed to catch six species of fish during the few hours which “won” the match and a bottle of wine. Secretary Ian Mock caught the largest fish – a chub of nearly four pounds in weight which was in fine condition. Good News For By Brook! BART has just received confirmation that it has been awarded a Partnership contract to carry out improvements on the By Brook. You can see a draft of the information release below the photos which are of the type of issues we will want to address on the Brook. 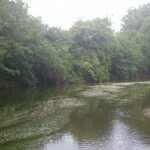 Bristol Avon Rivers Trust (BART) is delighted to announce that they have been chosen by the Environment Agency to lead a Partnership Project on the By Brook. The project comes early in the second year of BART’s development and is a great opportunity to engage with local landowners, farmers, community groups and sporting organisations along the river to deliver much needed environmental improvements to the brook and its tributaries. BART is a community-led organisation, which aims to deliver education, land and river based management advice and practical river restoration work across the Bristol Avon Catchment. We pride ourselves on getting our feet wet and our hands dirty and on getting things done. We do this by bringing together individual people, interest groups and community organisations with common interests and problems. BART helps to realise these as achievable projects by adding their experience, practical science and by using its volunteer support. Where necessary and possible, BART works in partnership with other organisations and in this particular project would expect to work with the Friends of the By Brook Valley, Avon Wildlife Trust, Wiltshire Wildlife Trust, Buglife and the Environment Agency, among others. Initial funding for the By Brook project amounts to £140K, over the first year and is a vote of confidence in BART’s ability to deliver. 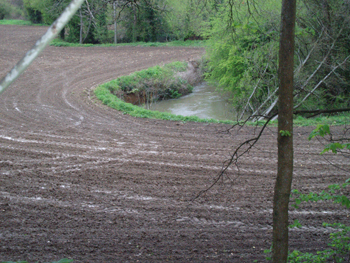 The work will involve a number of strands with an emphasis on improving the Brook’s Water Framework Directive classification from “Poor” to “Good” over time. The initial phase will involve working with local stakeholders to determine quick wins that can be delivered in 2013-14 and carrying out survey work, essential to determine numbers and types of invertebrates and fish present in the Brook. 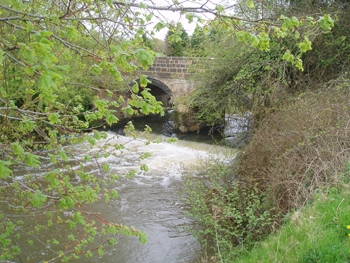 Feasibility work for fish passes will be carried out on a number of weirs, which would help improve the ability of fish to move between spawning, nursery and feeding grounds within the Brook and to colonise areas currently lacking in variety and numbers. An experienced Farm Liaison Officer will work with farmers within the catchment to help them develop “catchment friendly” methods of farming that will greatly help the By Brook to recover some of its former ecological diversity. An essential part of this work will be a survey of native white clawed crayfish as these scarce creatures are present within the Brook and its side streams, despite the incursions of an invasive species , the signal crayfish. It is hoped that successful feasibility studies and completion of a number of habitat improvements will lead to further work on the Brook in future years. If you are interested in following the progress of this project, you can do so on BART’s website at www.bristolavonriverstrust and if you feel you’d like to contribute in any way to this or any future projects we would be delighted to hear from you.